United Nations Secretary-General Ban Ki-moon: "Today we face the risk of an all out escalation in Israel and Gaza with the threat of a ground offensive still palpable and preventable only if Hamas stops rocket firing." The Lebanese Internal Security Forces detained two persons for having fired rockets into Israel. Egyptian security forces seized 20 rockets on their way to being smuggled from Gaza. Mahmoud Abbas, chairman of the Palestinian Authority, attended a Ha'aretz "peace conference" in Israel the day the current fighting began* and has infuriated Hamas by his willingness to continue to work with the Government of Israel. Jordan's Foreign Minister Nasser Judeh demanded that Israel "stop its escalation immediately," but balanced this with calls for "the restoration of complete calm and avoidance of targeting civilians" and "the return to direct negotiations." François Hollande, president of France, gave Netanyahu the most vervent backing of any foreign leader when he assured the Israeli leader that "France firmly condemns the attacks" against Israel and expressed "the solidarity of France against the rockets being fired from Gaza. The Israeli government must take all necessary measures to protect its population against threats." Jordan's Foreign Minister Nasser Judeh. The media too is displaying an unwonted fairness to Israel. The BBC published an article, "Are #GazaUnderAttack images accurate?" about pictures claiming to show the effects of Israeli airstrikes on Gaza and found that "Some of the images are of the current situation in Gaza, but a #BBCtrending analysis has found that some date as far back as 2009 and others are from conflicts in Syria and Iraq." CNN's Jake Tapper asked former PLO legal advisor Diana Buttu about a tape of Hamas spokesmen encouraging civilians in Gaza to protect homes of Hamas' leaders with their bodies. When Buttu retorted by calling this a racist accusation, Tapper replied, "It's not racist, we have video … That's not racist, it's a fact." Tapper and Buttu on CNN. Overshadowing all these indications, but less surprising, Rasmussen reports that likely American voters by a nearly 3-to-1 margin (42 to 15 percent) blame Palestinians more for the conflict in Gaza than they blame Israel (according to a survey conducted on July 7-8, just as hostilities began). This is perhaps the single most important statistic about the conflict from outside the Middle East, certainly more so than Security Council votes. * Correction: My information about Abbas attending the Ha'aretz conference came from the Al-Monitor article linked to above, where it says that "At the height of the Israeli bombardment of Gaza early July 8, Palestinian Authority President Mahmoud Abbas surprised the Palestinians by giving a speech at a peace conference organized by the Israeli newspaper Ha'aretz." But journalist Adi Schwartz has corrected this, writing me that Abbas did not appear at the event: "all Palestinian delegates who were supposed to attend, decided to boycott the conference. He wrote an op-ed for the paper." Prior to Israel's attack on Gaza at dawn on July 8, Al Jazeera Mubasher Misr channel reported that Maj. Gen. Mohammed Farid al-Tohamy, the director of Egypt's General Intelligence Service, had visited Tel Aviv hours before the attack and met with Israeli security officers. It also reported that Egyptian President Abdel Fattah al-Sisi had given Israel initial approval to launch a military operation on Gaza to destroy Hamas. During his speech on the anniversary of the Yom Kippur War in October 1973, on the evening of July 7, Sisi notably did not express his objection to the Israeli aggression on the Gaza Strip. Al-Monitor contacted by phone a former member of the Egyptian People's Assembly, who spoke on the condition of anonymity. "Egypt may not seem to be in a rush to end the Israeli aggression on Gaza, because Egypt's foreign policy is associated with its domestic policies. It is clear that Sisi considers Hamas to be an extension of the Muslim Brotherhood in Egypt. Thus, we do not expect him to shed a lot of tears if Israel dealt Hamas a severe blow," he said. The Arab Center for Research and Policy Studies, managed by Arab thinker Azmi Bishara, made a similar statement on July 10, saying that "Egypt is currently not enthusiastic to play the role of mediator between Hamas and Israel, as it shares the same interest with Tel Aviv, which is to make Hamas and Gaza pay a dear price." July 12, 2014 updates: (1) Mahmoud Abbas said that Hamas should sacle back its demands to reach a ceasefire and both sides should immediately cease hostilities. "We are the losing side, and every minute there are more and more unnecessary deaths. I don't like trading in Palestinian blood." He asked Hamas: "What are you trying to achieve by sending rockets? We prefer to fight with wisdom and politics." In response, Hamas tore into Abbas, accusing him of "aiding the enemy" and "acting as a third party" while calling him "a criminal" and "a Likud member." (2) Abu Ali, a driver for his family business in Gaza, told the Associated Press: "Everybody here hates Hamas. But they're too afraid to say so publicly. Our food comes from Israel but what we give them in return is rockets — rockets that don't even make little holes in the ground." Azza Sami, Al-Ahram: "Thank you Netanyahu and may God give us more like you to destroy Hamas." Amr Mustafa, actor, addressing Palestinians in the Gaza Strip: "You must get rid of Hamas and we will help you." Hamas should stop meddling in the internal affairs of Arab countries: "Pull your men out of Egypt, Syria and Libya. In Egypt, we are today fighting poverty that was caused by wars. We have enough of our own problems. Don't expect the Egyptians to give more than what they have already given. We've had enough of what you did to our country." Al-Bashayer newspaper: "The standard of living for a Gazan citizen is much higher than that of an Egyptian citizen. The poor in Egypt are more in need than the poor in the Gaza Strip. Let Qatar spend as much as it wants on the Gaza Strip. We should not send anything that Egyptians are in need of." When Amr Adeeb, a famous television presenter and journalist criticized Sisi's "silence" toward the war in the Gaza Strip, many Egyptians told him to shut up. One example: "Hamas is responsible for the killing of Egyptian soldiers." Hamdi Bakhit, a former general: Israel should re-occupy the Gaza Strip because "this would be better than Hamas rule." Amany al-Khayat, a television presenter, accused Hamas of depicting itself as a victim of an Israeli attack to get Egypt to reopen the Rafah border crossing with Gaza. "They just want us to open the Rafah border crossing. Hamas is prepared to make all the residents of the Gaza Strip pay a heavy price in order to rid itself of its crisis. We must not forget that Hamas is the armed branch of the Muslim Brotherhood terrorist movement." Ahmed Qandeel, head of the Energy Studies Program at the Al-Ahram Strategic Studies think-tank, denounced the targeting of Israel's nuclear facility in Dimona as "idiotic" and warned this endangers the lives of Egyptians and Arabs: "Egypt must take precautionary measures." In response to this comment, an Egyptian wrote: "May God make the State of Israel victorious in its war against the terrorist movement Hamas during this holy month of Ramadan." Mustafa Shardi, journalist: "No Arab country has done for the Palestinians as Egypt did. 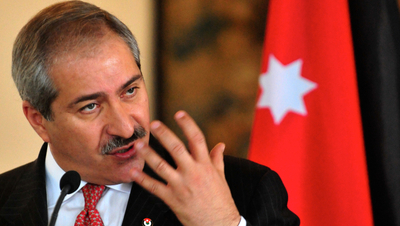 Why doesn't Hamas go to [Turkish Prime Minister Recep Tayyip] Erdoğan? Where is Erdoğan when you need him? Why is he silent? If he opens his mouth they [Israel and the US] will hit him with a shoe. The Egyptian people are asking: Where are our people who were kidnapped and taken to the Gaza Strip? Hamas should apologize for the 1,000 tunnels that were used to smuggle the resources of Egypt. They all have their own planes and accounts in Swiss banks." Mohamed Dahlan, a former Palestinian Authority security commander, predicts the Egyptians will do nothing to save Hamas: "Egypt won't intervene to stop the war on the Gaza Strip because Hamas was conspiring with the Muslim Brotherhood against Egypt. Hamas was working with Muslim Brotherhood against the Egyptian army." After Palestinian Authority Chairman Mahmoud Abbas telephoned Sisi to urge him to work for an "immediate ceasefire" between Israel and Hamas, he admitted that his appeal to Sisi had failed. 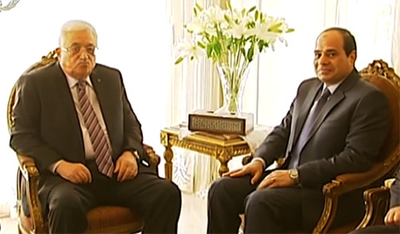 According to Abu Toameh, Sisi (like many Egyptians) seems "to be delighted that Hamas is being badly hurt." Khaled Abu Toameh's caption: "An uncomfortable moment during an April 2014 meeting between PA President Abbas and Egyptian President Sisi." Hamas has remarked on the Egyptian attitude. A spokesman noted: "It's disgraceful to see that some Egyptians are publicly supporting the Israeli aggression on the Gaza Strip while Westerners are expressing solidarity with the Palestinians and condemning Israel." Hamas leaders are using words like "betrayal" and "collusion." (2) For a scorching attack on Hamas by Egyptian television personality Hayat ad-Daradiri, see this. She calls on the Egyptian military to help the IDF in hitting Gaza with force. Hayat ad-Daradiri on Egyptian television calling for Egyptian help to Israel against Hamas. leaders around the world are showing some understanding for Israel's current operation in Gaza. Jerusalem may not be getting a blank cheque from the international community, but it is definitely getting some credit. Limited credit, but credit all the same. This time, even the United Nations is having trouble presenting a united front: The Arab League countries are divided. The Gulf states are having a hard time hiding their satisfaction that Hamas may suffer a difficult blow. Europe, as with all issues relating to foreign states and security, is not speaking with a single voice. Europe is more concerned with the World Cup and its own internal issues—like the Ukrainian army in Donetsk, which is more urgent and closer to home than Gaza. Even Iran has a score to settle with Hamas, after the terrorist organization was found to be fighting alongside the rebels in Syria. (4) Ibrahim Khreisheh, a Palestinian representative to the United Nations, warned on July 9 'that Hamas actions mean Palestinians cannot turn to the International Criminal Court for relief. The missiles that are now being launched against Israel – each and every missile constitutes a crime against humanity, whether it hits or misses, because it is directed at civilian targets. many of our people in Gaza appeared in TV and said that the Israeli army warned them to evacuate their homes before bombardment. In such a case if someone is killed, the law considers that a mistake rather than intentional killing, because [the Israelis] followed the legal procedures. As for the missiles launched from our side, we never warn anyone about where these missiles are about to fall, or about the operations we carry out. July 15, 2014 updates: (1) "Hamas is weaker than ever, even in the Arab media" writes Daniel Siryoti. Figures in the Arabic press have said that Hamas is culpable for the recent escalation of violence and the suffering of the more than one million Palestinians who live in Gaza. The criticism of Hamas has been expressed through various editorials and commentaries across the popular Arabic press, as well as by senior commentators on Arabic news programs covering the Gaza violence. Hamas is at its lowest point with regard to its image since at least 20 years ago, with criticism mounting across Saudi Arabia, Egypt, among the emirs of Persian Gulf nations, and in Jordan and Lebanon too. 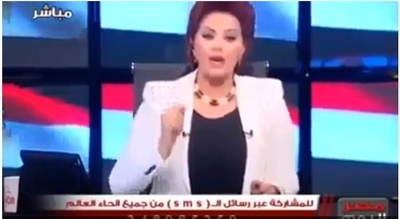 In Egypt, one anchorwoman said, "the ones accountable for the massacre Israel is carrying out against Palestinian citizens in the Gaza Strip is Hamas, which went out of its way to bring about the escalation with Israel, inviting Israeli aggressiveness, simply to pressure the Egyptian government to open the Rafah border crossing." 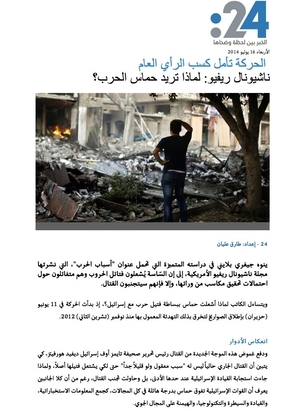 In Saudi Arabian newspaper Al-Watan, an editorial was published slamming both Israel and Hamas. "Hamas is more isolated than ever. The organization is revolting against the legitimate Palestinian leadership, while it is perceived globally as a criminal organization raining rockets down onto Israel." (2) For a selection of four biting, sarcastic, and sometimes humorous attacks by Egyptian television hosts on Hamas, watch this collection from the period July 9-12. Or read the transcript. (3) #BBCtrending reports that the Twitter hashtag "The Enemy's Name is Hamas" (العدو_اسمه_حماس#) has spiked over the past week, with more than 5,000 tweets, especially in Egypt. Asia Omar wrote, for example, that Israelis are "warning people in Gaza before they hit them, while we are being killed in our country and our homes." July 16, 2014 updates: (1) My article, "Why Does Hamas Want War?" came out in National Review Online on July 11 and is now a small part of the assault on Hamas. A prominent United Arab Emirates website, 24: News From One Moment to the Next, translated and published a bootleg copy as "شيونال ريفيو: لماذا تريد حماس الحرب؟ الحركة تأمل كسب الرأي العام " ("National Review: Why Does Hamas Want War? The Movement Wants to Win Public Opinion"). 24's translation of my article on Hamas intentions into Arabic. The translation by Tarqi Alyan is not perfect, nor am I credited as author, only cited as though I offered quotes for an article by Alyan. But it is pretty remarkable to see this, as my views have not been much promoted of late in the Persian Gulf. Well, it's always good to have a new audience; glad to find common ground in discussing Hamas. Media in Saudi Arabia and in Al-Sisi's Egypt – the countries considered to be the leaders of the Arab world's moderate axis and the main rivals of the Muslim Brotherhood (MB) movement, to which Hamas belongs – accused Hamas of taking unreasonable and irresponsible steps, of trading in the blood of the people of Gaza, and of exposing them to inevitable attacks. The Egyptian press was particularly vociferous in its criticism of Hamas and especially of the head of its political bureau, Khaled Mash'al, who recently called on the Egyptian army to come to the Palestinians' aid. An Egyptian pro-MB journalist even wrote that the Egyptian army has local problems to deal with, more pressing than the liberation of Jerusalem. The media in Syria, which is likewise resentful of Hamas and its leaders due to their support for the rebellion against President Bashar Al-Assad, also slammed this movement, saying that it has abandoned the resistance in favor of a Western plan to destroy the Arab world, and that Mash'al has chosen to manage the war not from Gaza but rather from Doha, the capital of Qatar, a country known for its support for the MB and "in whose palaces the Israeli and Western intelligence cells nest." The MEMRI report then provides 12 examples from Egypt, Saudi Arabia and Syria. Are Millions Worldwide Protesting Israeli Actions?